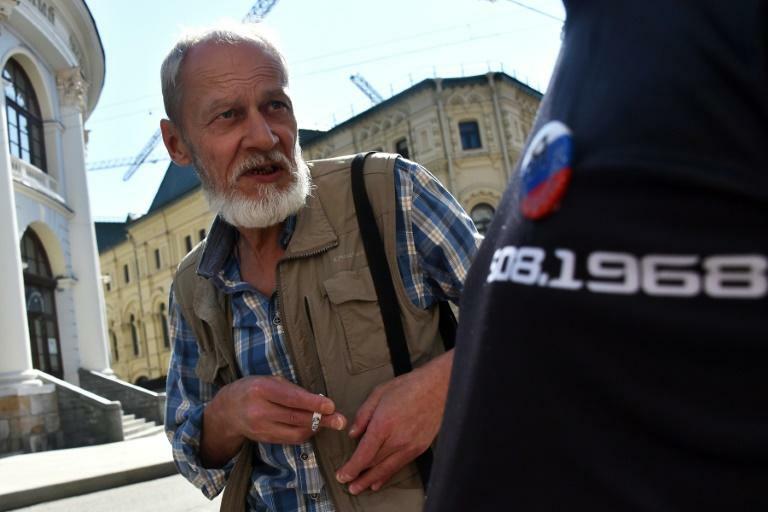 Moscow police on Saturday briefly detained three people marking the 50th anniversary of the 1968 Red Square protest against the Soviet invasion of Czechoslovakia, Russian media reported. According to liberal newspaper Novaya Gazeta, two of those detained were relatives of some of the eight Soviet protesters who stood on Red Square half a century ago before being hauled away by the KGB secret police. Anna Krasovitskaya, the granddaughter of the poet and translator Natalya Gorbanevskaya who spent two years in psychiatric hospitals as punishment for the 1968 protest, was one of those detained. She was reportedly holding a poster in support of Ukrainian film director Oleg Sentsov who has been on hunger strike for over three months in a Russian prison. Police also detained activist Sergei Shavrov-Delaunay, a relative of the poet Vadim Delaunay who was sentenced to three years in a Siberian prison camp for taking part in the protest against the invasion. He was detained along with Russian liberal politician Leonid Gozman. According to Novaya Gazeta, the pair tried to unfold a banner that read "For your freedom and ours", the same slogan the 1968 protesters had written on theirs. According to independent monitor OVD-Info, the trio were taken to a central Moscow police station. All three were released three hours later. The monitor said around 50 people took part in the rally, which police did not allow because of a military music festival on Red Square. Physicist Pavel Litvinov, one of the eight original Soviet protesters, took part in the rally. The August 25 1968 protest against Soviet authorities sending tanks into Prague was a symbolic gesture that launched the political dissident movement in the USSR. Soviet troops had invaded the city five days earlier, bringing an end to the Prague Spring, a tentative attempt to liberalise the Communist system. Standing in the square, they only had time to raise a few placards which read "Shame on the occupiers", "For your freedom and ours" and "Long live free and independent Czechoslovakia" before being arrested by the KGB. Most of those eight demonstrators -- Natalya Gorbanevskaya, Pavel Litvinov, Viktor Fainberg, Vladimir Dremlyuga, Konstantin Babitsky, Larisa Bogoraz, Vadim Delaunay and Tatiana Bayeva -- paid a high price for their protest. In June, the Czech government handed the remaining three -- Litvinov, Bayeva and Fainberg -- an award to mark the 50-year anniversary of their protest.